I thought I’d share with you 10 guidelines for making your presentation look modern that came out of this process. You don’t need to be presenting to millennials to want your slides to look modern — no one wants to look out of date. Even if you aren’t a designer, you can create better looking slides with a little attention. Nothing here is hard to do. On the other hand, “modern” is only one style. Always consider your audience and the type of impression you want to make. Maybe you’re an investment bank and want to look traditional. Maybe you teach quilting and want to look retro. Most importantly, your design should match your message. A presentation on how to be calm and get enough rest should look different from a presentation about how to hustle to get more business. So, here are 10 tips for modern design for your presentations. Thin fonts are popular now. You’ve probably seen the change on websites and on your phone. There’s a reason that you’re seeing thinner fonts on your phone. With the increased use of mobile phones, which have small screens, all aspects of design need to take up as little space as possible. Unfortunately, this sometimes comes at the cost of legibility. For a presentation, test your font at the back of the room and consider the needs of people who are older. 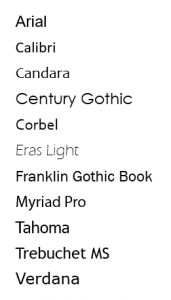 Here you see a few of the fonts that come with Windows 10. You can see how some are thinner than others. Remember that the weight of the line (stroke) and the width of the letters are two different attributes. You can counteract a thin line by choosing a font with wider letters. Century Gothic is a good example. The “thin” principle applies to borders and lines, too. If you have a border around an image, make it thin. If you use a rectangle, make its outline thin. This will appear more elegant–and modern. You don’t need to make EVERY line thin. You can use exceptions for contrast and to attract attention. Flat design is in. It wasn’t always so! In 2011, I wrote a couple of posts about how to create the Web 2.0 look in PowerPoint here and here. Then, reflections and highlights were all the rage. You still see them in presentations, but they don’t look as modern anymore. Flat design means no reflections, highlights, or shadows, which give a 3D look. Shadows are still used quite a bit — I use them fairly often. But they aren’t part of flat design. 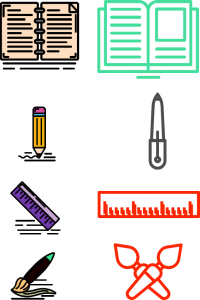 Popularized partly by the Microsoft Windows desktop, which features a grid of icon, the grid look is an example of flat design. I wrote a blog post about how to create one variation here. I’m certainly not an expert on color, but faded colors are less likely to look modern. They look great in some cases, but you’ll see more of the richer, saturated, complex colors plus grays and taupes. You’ll see lots of exceptions and I don’t suggest that you go out and rebrand because of this, but if you’re starting out from scratch, ask a good designer what colors will look more up to date. White space means unused space. Of course, if your slide background is black, the unused space won’t be white, but you get the point. Filling up your slides with lots of stuff won’t look modern. Less is more. Think minimalist. Remember that the more you put on your slides, the less people pay attention to you. One exception is a full-slide image, which leads me to the next point. Small images tend to look old-fashioned and larger images are more bold and powerful. Images should be relevant to your point and not just for decoration. 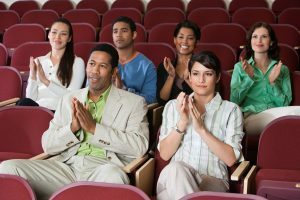 Their point is to help the audience understand and remember what you’ve said– and sometimes to be persuasive. 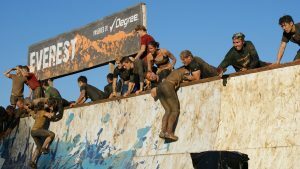 Not sure which images to use? I explain my BARE system for choosing the right images here. Putting images against the edges of the slides makes them look more modern. I think it’s because when you put an image in the middle of a slide, that creates 4 edges but when you put an image against the edges of a slide, you don’t see those image edges as an extra element. I call this the 3-side rule and I explain it here. I once worked with an attorney who was defending a doctor. He wanted to show that the doctor had modern equipment and offices. I showed him how putting the photos of the office against the edges of the slides made them look more modern. That’s a good example of how you can use design to match your message. Remember the ugly clip art of the 1980s? Not modern! But a new trend is icons, but they’re clearer and cleaner. By clean, I mean they don’t have a lot of extraneous lines in them. Compare the 2 columns of icons shown here. The ones on the left have lots of extra lines while the ones on the right have a minimum number of lines. Do you see how the ones on the right look more modern? I got these from Stockunlimited, which also offers photos. When you have a lot of text on your slides, people read the slides. While they’re reading, they can’t easily listen to you. In fact, your voice is annoying because it’s interfering with them reading. People hate this. It’s not hard to divide up one text-heavy slide into multiple slides. But it isn’t only text. You don’t want your slides to be full of charts either. Put one chart on a slide (unless you need to compare data) and simplify charts as much as possible so that the point leaps out at the audience. Use the Tell ‘n’ ShowSM method. 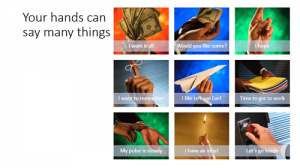 Tell the point in your slide title and show it with an image, chart, or diagram. It’s just like the boy’s picture book–one side tells the story and the other shows it with a BIG picture. 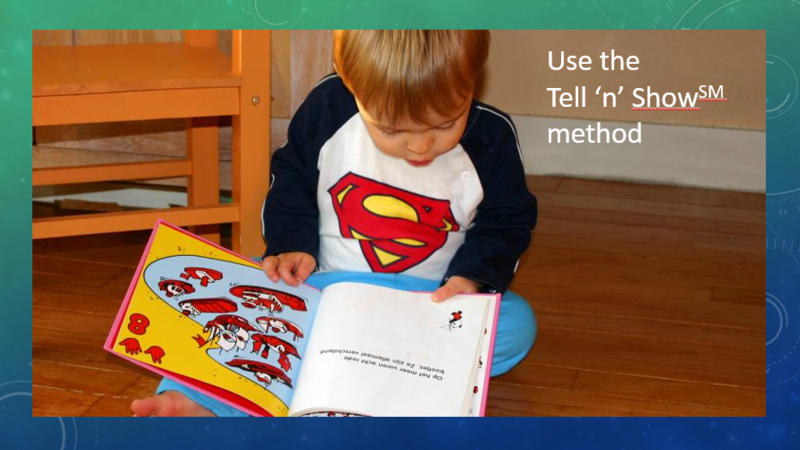 The slide itself follows the Tell ‘n’ ShowSM method, too, with a title that tells the point and an image that shows it. I know that you sometimes need some text on a slide, but after removing as much as possible (remember that you don’t need to put everything you say on the slide), try to find a way to remove bullet points. Bullets look boring and old-fashioned. Sometimes, you can just select the text and click the Bullets button on the Home tab to get rid of them, but if that’s too confusing, use SmartArt. Click the Convert to SmartArt button and choose a layout that is simple and makes your text clear. It will look more modern! I’ve asked some other presentation bloggers to blog about this topic to create a “blog roundup.” So please visit these posts and leave a comment there. Tell them that you found them at EllenFinkelstein.com. Each person has a totally different perspective; I know you’ll find these interesting–and you’ll learn a lot, too. From George Torok, Modern Presentation Design? What do you think makes a slide look modern? Leave a comment and please use the Share buttons to share with your colleagues! 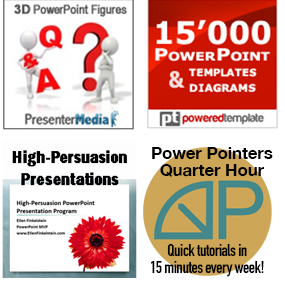 If you haven’t yet subscribed to my PowerPoint Tips Newsletter, I invite you to do so here. Hello Ellen, I agree with everything above, but would re-frame your point on THIN BORDERS. Any shape filled with a colour other than the slide background colour (I am Canadian…) should have NO border at all. So the only borders left, and thin, would be used for white space on a white background, etc… This is fully consistent with the principles underlying everything you wrote in that post. I certainly remove outlines from shapes all the time but in this situation, there was a photo with a lot of white in it on a white background and so a border helped frame the photo. Ken, I was glad you brought up the issue of user interfaces. I sometimes think that the software companies change interfaces with each update just to keep those UI Designers busy — but not for any purpose that helps the end user. And I agree that they think too much about design and too little about ease of use. But as I mentioned, they are now designing for various sizes of screens — what fits on a 60-in LCD TV must also fit on a smart phone. It’s a new world out there! Ellen, valuable tips. I found the suggestion about moving the image against the edge intriguing because I’ve seen that work well in marketing materials. Great article as always Ellen. I would add to point 8 that modern icons are in addition to being clean, are monochromatic (as you demonstrated in the right hand column). They are also often designed as families of vector graphics (allowing the colour to be adapted to the deck design) using a common visual language. One could elect to use icons from different designers but they may not look right together when used on the same slide. The new icon library feature of PowerPoint demonstrates these points. I’ve also seen that most (but not all) modern icons are a single color. I think that helps viewers to focus on the meaning of the icon as opposed to how pretty it looks. After all, icons are a kind of sign, done in pictures instead of words. I sometimes wish that the words would be there, too, as I don’t always know what the icon means, especially in software and on websites. In presentations, you need to make sure that the meaning of the icons is obvious to the audience. Hi Ellen, Your tips are spot on with everything you present. Keeping a design as simple as possible is even more important now. I have always used several of your tips as a designer but I love that bullets are now no longer necessary in corporate design. Jilly, thanks for your kind comments. I think bullets are dying! Well, you just shared an informative post. Presentation designers should know about modern designs as 2017 has started and as a designer, you should know so that you can make modern designs for your customers. and these tips are so useful. I used it for my presentation and it looks quite attractive. These design tips if coupled with computer aided programs can give out wonderful result and will be of great help for illustrators.